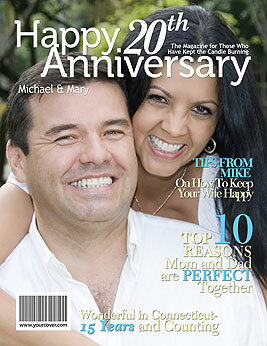 Custom 20th anniversary magazine cover featuring a photo of the couple - a unique gift to celebrate a milestone anniversary. A 20th wedding anniversary is one that should be celebrated with style – and what’s more glamorous than a star-turn on a personalized 20th anniversary magazine cover. To make this unique personalized 20th anniversary gift, upload the couple’s original wedding photo or a more recent photo and then personalize the headlines to be all about their life together. Don’t forget to include happy memories and family members’ names. It’s simple to make a fake magazine cover at YourCover thanks to our easy to use online magazine cover generator. More than a fake magazine cover, a YourCover personalized magazine cover gives you the opportunity to be creative and include all the special things that you love about the recipients. You will be creating a 20th anniversary gift that’s as unique as the couple starring on the front cover. A special keepsake to commemorate a milestone 20th anniversary, a YourCover personalized magazine cover is a unique 20th anniversary gift that will be cherished for many years to come! fake magazine cover using the YourCover magazine cover generator.